Charlie Company tried something different - again. As they had done before in May 1967, the company did a night amphibious assault.. This was during a phase in operations when we were interdicting infiltrating NVA to keep them from massing for an attack on a major objective. Intelligence wasn't very good. Basically, we seemed to be searching villages at random. Our normal mission for this type of operation was to cordon off a village to prevent NVA or VC in the village from escaping. After we would establish a cordon, the RVN National Police, the "white mice," would chopper in and search the village. An American AID (Agency for International Development) advisor was always with them. The white mice would question villagers and search the area for evidence of NVA or VC presence or movement. We would often round up a few of the enemy using these tactics. But, we weren't as effective in the cordon and search technique when we moved in during daylight hours, including air assaults at dawn. The enemy could see us coming and sometimes fled from the area before we could conduct effective operations in and around the villages. It seemed to make sense to move in before daylight and establish our cordon before dawn. The troops were not used to moving as a company at night, but after we did it a few times and were successful at surprising the enemy, it became routine. We got very good at it and could move into a position at night without even causing a dog to bark. That morning, (August 2) we moved out about 0300 from a position about 2 or 3 km from our objective, a village on the plain near Bong Son, as I recall. We moved on a direct azimuth to the objective with platoons in column, ranger style, leaving the weapons platoon with one mortar at our previous position for indirect fire support. I remember that it was an uneventful operation and the white mice had come and gone when we began to move out of the area in early afternoon. As an aside, that morning our headquarters medic treated a little girl and a couple of women who had been injured a day or two before, unrelated to our operation. Our company docs helped where they could. While we were moving out of that position, a burst of AK 47 fire killed Stottler and wounded two others. We immediately set up an LZ and medevaced the wounded while two platoons searched the village for the weapon, its owner and any other enemy. We did not find anything, unfortunately. We continued for several days with the cordon and search operations in and around that area using the same tactics of moving at night. We had some successes and, thankfully, had no more casualties during that phase. Ray Long was with the Mortar Platoon, and recalls the company returned to LZ English on Chinooks after the operation was over. Cordon and Search missions were a normal part of operations. Another such mission can be seen on the October 1968 page. Jack Yeagley also sent this email - the Webmaster invites anyone with more information to contact him. 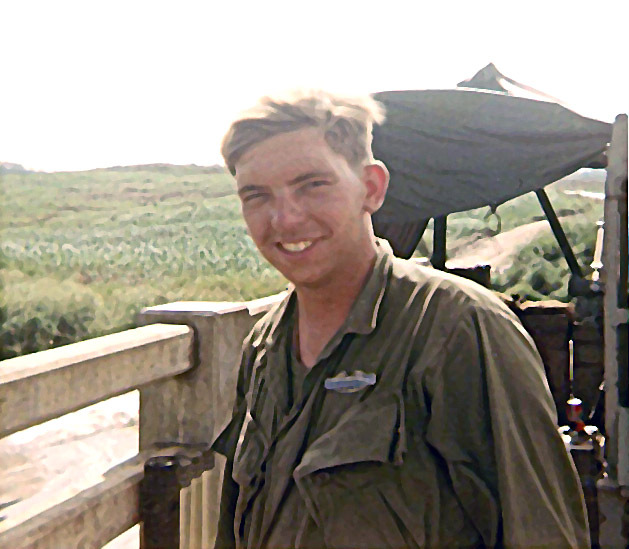 A few days later, Charlie Company conducted an amphibious assault like the one described by another contributor. 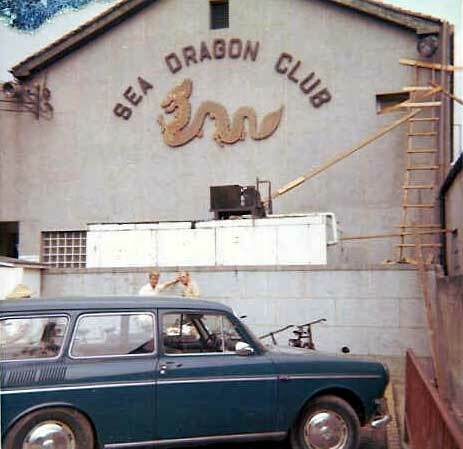 (Note: May 1967) It may have been on the same coastal village. The objective was a long and narrow fishing village, about 1 km from south to north on the beach of the South China Sea coast. The village was only a couple of hundred yards deep from west to east. A river, too wide and deep to walk through, separated the village from the main plain on the west. All we had to do was seal off the north and south ends of the village and quickly get some troops across the river to cover the river with machine gun fire. The element that sealed the north end of the village took automatic weapons fire while a machine gunner was swimming a borrowed small fishing boat across the river. I was told that he never missed a stroke under fire; got his weapon in position and laid down a base of fire while the rest of the squad came across in fishing boats to his position. All of this took place within a very few minutes after we landed on the beach from two "mike" boats just before first light. The mike boats were small landing boats that had a capacity of up to about fifty fully equipped soldiers. Navy swift boats supported us with mortars, although I was a little skeptical about calling in mortar fire from a rolling deck. We didn't have a need for them, as it turned out. The operation was successful. 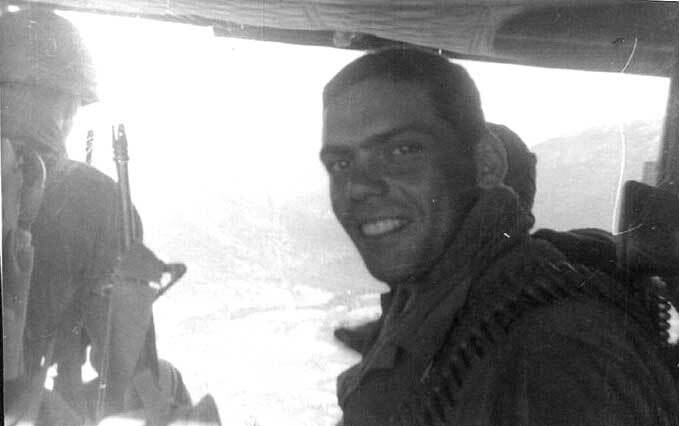 Charlie company captured a few NVA soldiers as well as other items during the search phase. And, the Asst. Division Cdr., BG Irby visited us to get a look at the operation. 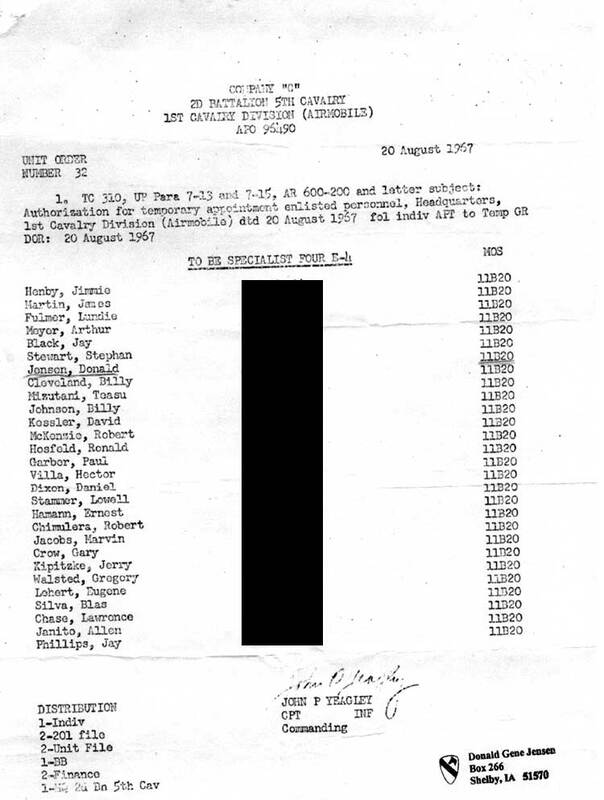 The following members of Charlie Company are promoted to Sergeant E-5 by 1st Cavalry Division Special Order 243: Christopher Gadsden, John Niclaus, Dennis Kuzka, Kenneth Rothenberger, Carlos Garcia, Luther Anderson, Richard Keefe, Robert Chismer, Lawrence Jesse, Nathaniel Simms, and Max Johnson. 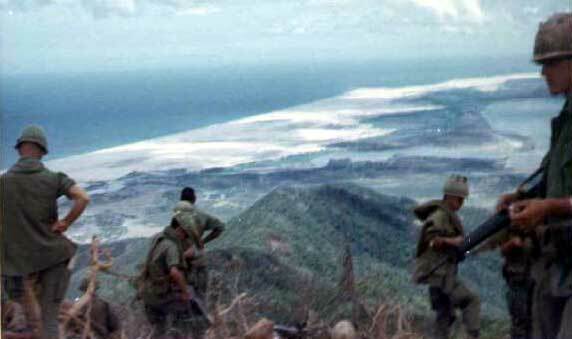 C Company troopers descend the Cay Giep mountains near the coast in Binh Dinh Province. Looking south, the South China Sea is to the left. Just under the chin of the soldier standing at the extreme right is Dam Tram O lake. 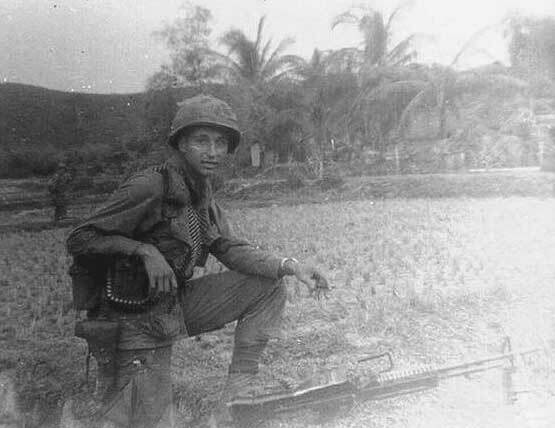 Behind the head of man with no helmet lies the village of Hoa Tan, the site of the beginning of heavy combat in March 1967. 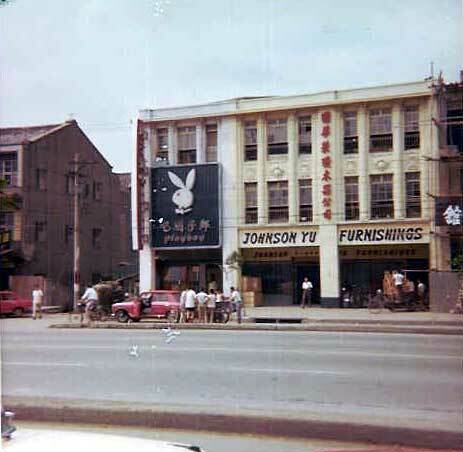 A similar view can be seen on the July 1967 page. 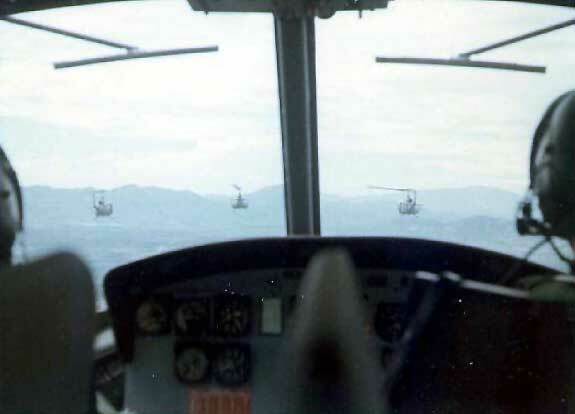 While it was pretty crowded inside a "slick" during a "CA", if you were up forward behind the pilots, you could look forward over their shoulders. It appears the formation is flying west towards the mountains. 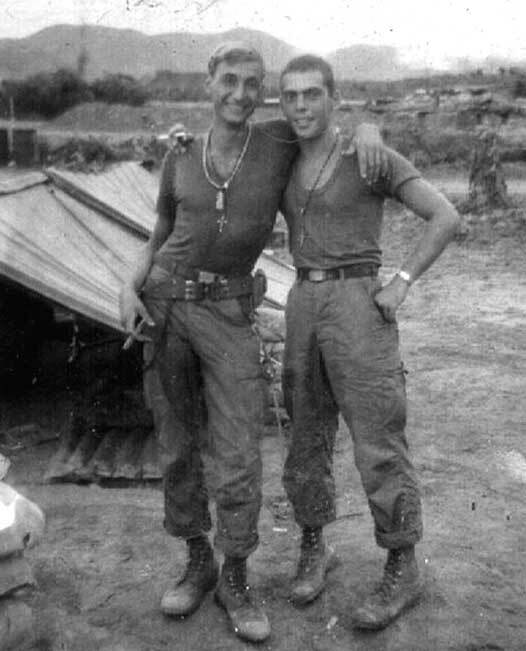 Tony Vic and Anthony Drames at a firebase somewhere in the Bong Son area. Note how muddy the ground was. When LZs were built, every blade was grass and every tree was bulldozed. When the wet season came, everything had a covering of mud. 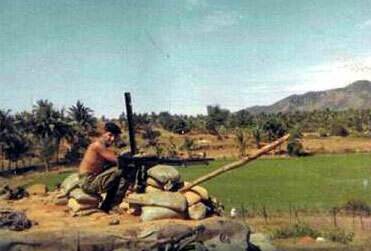 Tony manning a machine gun post at another base. Most likely Tony was at An Khe when this manly picture was taken. 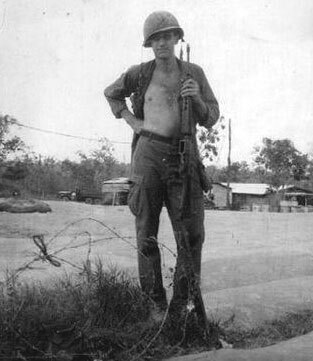 It was likely An Khe because there are permanent buildings in the background, and there is no magazine in his weapon. Don Demchak had this photo taken at the Bong Son bridge - with what looks like a brand new metal CIB.